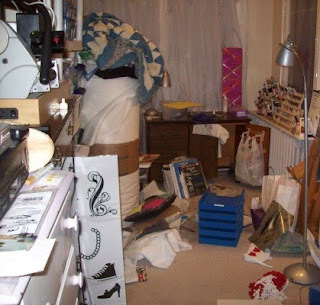 It's slightly incorrect to say this is a "before" picture of the other part of the sewing room. This is actually a "between" photo. Earlier on Sunday, this area didn't have all of this stuff in it. It had a pile of fabric in it that needed to be put away. But once I did that, I started pulling things off of the shelf in the corner to go through it, paring it down, organizing what was there, and generally getting a grip on it. I also went through the items in the lavender-white dresser in the left foreground of the photo. Most of the drawers used to have jewelry making supplies in them, but I pulled them out and haven't gotten them filed back in. But the bottom drawer has all of the smocking supplies and patterns in it. Those blue in-boxes in the middle of the floor were filled with miscellaneous papers and paper-sized packages that needed to be sorted through. I'd like to get through the stuff on that four-shelf unit and possibly eliminate the need for it entirely. The more I can narrow down what I have in that room, the more spacious the room will be and the easier it will be to work in there. I'll share more photos as I make more progress, but I thought I should let you know that it is coming along. I am glad i am not the only one with a space in disarray! I know it takes lots of effort, but you're going to have a terrific room when you're all done. You're doing great, just keep at it! Thanks Diane and Susan for the supportive comments! I know I'll love being in there once I have it all together. And now I've got a TV, VCR and DVD player in there, so it will be easy to work at something for long periods of time. Yes, my sampler is a Theresa Wentzler and it IS taking me forever, mostly because I haven't worked on it in several years. I think I started it in about 2004 or so. Anyway, it was a LONG time ago. I've broken the remainder of the sampler up into 12 chunks to do one per month for the OPAM challange. This is supposed to be my December finish. Since I just finished January's chunk, I'm already behind. lol Oh well.